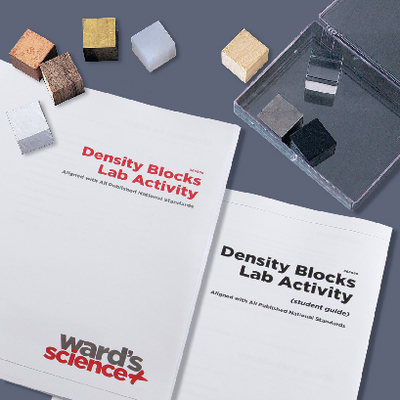 This lab consists of three data gathering activities using blocks of different substances. Students will use their knowledge of density to predict and then test which blocks will sink or float when placed in water and determine the mass, volume, and density of each block. Students will also investigate the relationship between the mass, volume, and density of a single substance. The students' understanding of these activities will allow them to learn the concept of density and see that it is an important physical property of any element or compound. This activity employs the Framework Science Standard PS1 (Matter and Its Interactions). This kit has been aligned with all published National Standards. Pre- and Post-laboratory assessments and vocabulary words all target specific Science and Engineering Practices and common core standards. The teacher guide also contains specific "Did You Know" concepts that link the real world with scientific standards explored. This activity can be repeated with the materials provided in this kit. Ordering information: Lab includes Oak Block, Pine Block, Acrylic Block, Aluminum Block, Copper Block, Steel Block, Brass Block, PVC Block, Polypropylene Block, and Plastic Storage Box. One extra set of density blocks for activity III (optional), Plastic containers, Water, Electronic or Triple Beam Balances, Metric Rules and/or Tape Measure are required but not provided.